Add light and style to your building with windows. Most buildings come standard with 1-2 windows, which you can move practically any where on the building... for No Added Fee! Upgrade to more or bigger windows for even more light and ventilation. 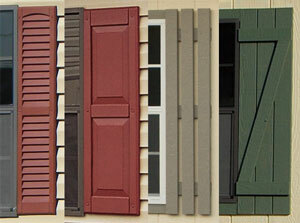 You pick the shutter color to match your style and can even upgrade to other shutters styles. Avid gardener? Add flower boxes under your windows for an added touch.